Jerusalem born conductor Asher Fisch is in Dallas this week to conduct the Dallas Symphony Orchestra in a series of concerts highlighting orchestral selections from Wagner's Der Ring des Niebelungen. This talented young conductor, a student of Daniel Barenboim, is Music Director of the New Israeli Opera in Tel Aviv and the Vienna Volksoper. 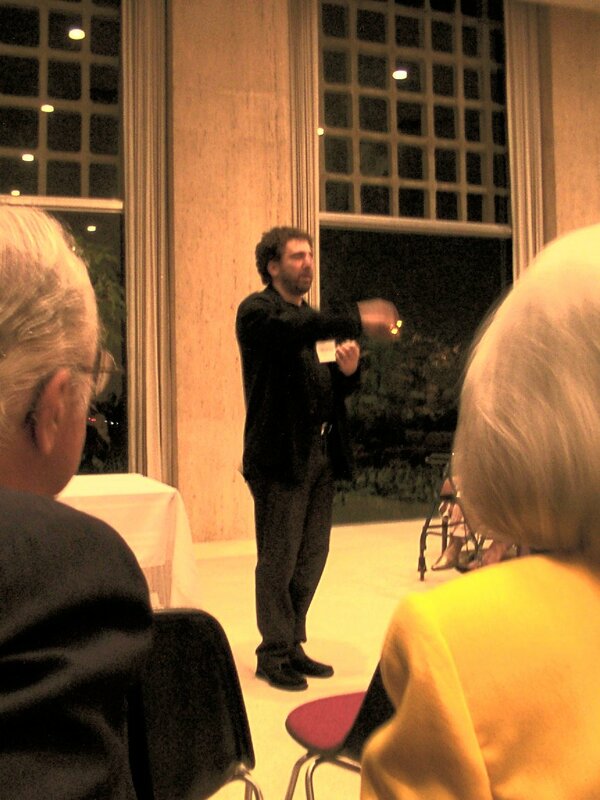 Asher Fisch was guest speaker at the evening meeting of the Dallas Symphony Orchestra Guild on March 26, 2003. He delighted his audience with an open Question & Answer session, in which he provided a highly entertaining mix of gossip and information about the world of music, the life of a traveling musician, and the challenges facing a Jewish conductor who wants to play Wagner in Israel. 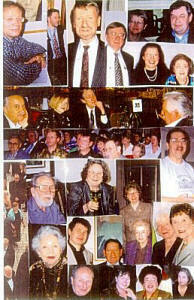 Members of the Wagner Society of Dallas were invited to this meeting, and those who attended added an extra layer of amiability to the gathering. 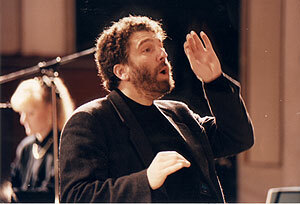 Asher Fisch is a young conducting professional who has performed all over the world. His repertoire includes more than 50 operas and a major segment of the symphonic literature, as well as chamber music and lieder recitals. He is a well known concert pianist in Israel and Europe in addition to his conducting duties. Partly as a result of his relationship with conductor Daniel Barenboim, he has become known as an advocate of the music of Richard Wagner in Israel. In his remarks, Asher Fisch pointed out that, even though Wagner wrote some extremely anti-Semitic articles and books in his lifetime, his music is not of itself anti Jewish. Jews and Jewish conductors have always been advocates of Wagner and his music, and even today, Jews all over the world, even in Israel, appreciate Wagner's music while overlooking his political and social view points. The current ongoing prejudice against Wagner in Israel is based more on political attitudes that came about as a result of events in Germany during WWII. Wagner was one of several German composers exploited by the Nazi's, and many composers whose music was much more beloved of the Nazi Regime than Wagner, such as Franz Lehar, are often played in Israel without any trouble. Of course, Lehar did not write anti-Semitic tracts. When it comes to playing orchestral excerpts from Wagner's operas, especially the Ring operas, Tristan, and Parsifal, conductors face a special problem. Wagner intended his music to be continuous, without a formal break, during the performance of his operas. However, since many of the most famous moments of these operas, such as Siegfried's Rhine Journey and the Ride of the Valkeries, are essentially orchestral rather than vocal in nature, conductors often want to play them as concert pieces. Unfortunately, Wagner did not provide concert arrangements for these often lengthy sections of music which flow continuously in and out of the musical fabric. As early as the 19th century, many conductors and composers attempted to solve this problem. Among them are Dutch conductor and composer Woulter Hutschenruyter, who arranged the Entry of the Gods into Valhalla and The Forest Murmurs from Siegfried, Ludwig Stasny, a Bohemian bandmaster who arranged Siegfried's Death and Funeral Music, and Wagner's friend Englebert Humperdinck, composer of Hansel und Gretel and other operas, who arranged Siegfried's Rhine Journey. While at times stylistically problematical, often substituting instrumental colors for voice parts, and with perhaps abrupt endings, such arrangements do provide an opportunity for audiences to experience this wonderful music outside the trappings of the opera house. In Asher Fisch's Thursday night performance, which I was fortunate enough to attend, these arrangements turned out to be very satisfying musically and sonically, but a bit confusing emotionally when played out of sequence and out of the context of the original operas. When performed as a set of pseudo-symphonic movements, they have the added problem of not building to climaxes properly and having too many sudden endings. Still, I did feel that familiar Wagnerian tingle, especially during Siegfrieds Tod. Hearing the Dallas Symphony Orchestra blare forth in the warm acoustic of the Meyerson Symphony Center gave a life and richness to Wagner's music that was not heard in recent Dallas Opera performances in the much larger Music Hall at Fair Park. I found Asher Fisch's interpretation of Wagner to be fairly straightforward and not especially intense. I also felt that, since it no longer sits as the Dallas Opera pit orchestra, and does not play this music very often, the Dallas Symphony Orchestra sounded a bit rough and unsure of where they were going during the Thursday night performance. Perhaps by the end of the run this week, they will have found their stride. 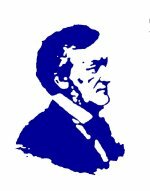 It is well known that Wagner has had a major influence on the music that followed him, and no composer who came after him created music without standing in the shadow of Richard Wagner. Composers such as Strauss, Mahler, and Schoenberg were openly influenced by the daring orchestral techniques and large scale musical structures that Wagner invented. Yet even a composer as seemingly un-Wagnerian as Debussy learned to paint delicate tone colors from the Forest Murmurs in Siegfried. Wagner's music was as often delicate and finely textured as it was grandiose. A guest conductor who comes into town to conduct the local symphony in a subscription concert faces a special challenge: he needs to know the music better than the orchestra players already do. These days, young conductors rarely face an orchestra that has not played the piece he is getting ready to conduct many times. Years ago, when new pieces were first composed, conductors and orchestras usually learned the music together. For example, Stravinsky's Rite of Spring had 65 rehearsals before its first performance. These days, that is no longer the case. Most orchestras in America can now play pieces like the Rite of Spring almost from memory. So a visiting conductor needs to inspire the orchestra to play well, bring to them a new viewpoint about the piece, or show them something new in the interpretation. This is a difficult task for a young conductor who may still be learning the repertoire. Nevertheless, it is easy for a good but inexperienced conductor to have a great success when the orchestra knows a certain score well. He really does not have to do anything but let them play! 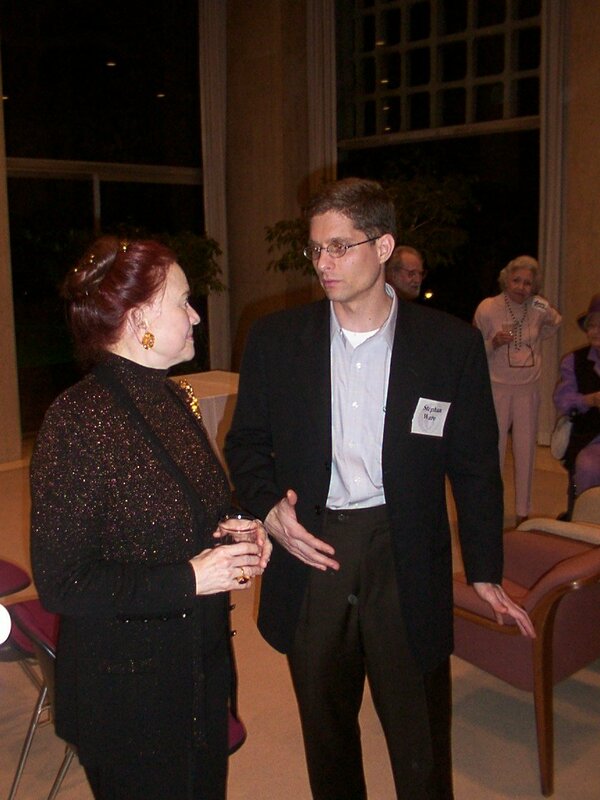 Guest conductors also face a challenge that most audience members are not aware of: the performance appraisal. At the end of a concert series, the orchestral players rate the conductor on how well he did. It is the same performance review we all face in our jobs. If he does not get along with the orchestra, is not polite to them, or for some reason they do not like him, be assured he will not be invited back, even if the audience loved his performance. On the other hand, a well-liked conductor that did not please the audience and local critics is assured of a return invitation if the musicians in the orchestra gave him a good performance appraisal. Critics are less important to a conductor's career than one would imagine. While it is true that a rave review in the NY Times can make a career, a bad review in the Dallas Morning News cannot do much to disturb a career, even locally. Sure, a lot of bad reviews can hurt, but not one or two. Asher Fisch will be conducting a series of concerts for the Dallas Symphony Orchestra, March 27, 28, 29, 30, 2003, containing highlights from Richard Wagner's Ring of the Niebelung. Other music on the program will be Concerto da Camera: La Folia, by Israeli composer Menachim Wiesenberg and Mozart's Piano Concerto #22, K482, played by pianist Paul Badura-Skoda in his DSO debut. This evening's Dallas Symphony Orchestra Guild meeting was introduced by DSOG President Martha Aler. DSOG Vice-President of Benefit Rebecca Jane Bailey made an announcement of the upcoming DSOG Gala 2003 which will be held in April. Vice President of Evening Education Jo Jagoda introduced the speaker. 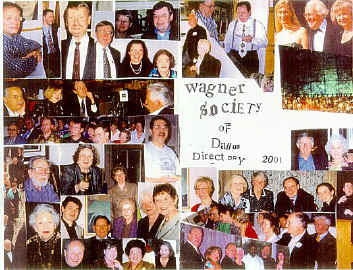 WSD Chairman Virginia Abdo presented the Wagner Society of Dallas to the group. Please let us know ONLY if you are coming. Call 214/363-6070. Or mail your confirmation to: WSD, P.O. Box 25201, Dallas, TX 75225-0201. This program will begin promptly at 7:30 p.m., with a social hour and refreshments by Angie Fiore beginning at 7:00 p.m., so plan to arrive in plenty of time to visit and be seated.